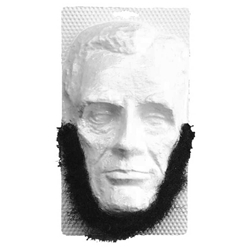 Includes one self-adhesive beard that is styled after the look of Abraham Lincoln's short full-face beard. This beard is often referred to as a "Chin Curtain Beard" and was worn by President Abraham Lincoln for a portion of his life, including his Presidency. Pair this beard up with a stove pipe top hat to create the look of Abraham Lincoln for school projects or historical dress-up. Additional adhesive tape is available if you need to apply this beard multiple times.